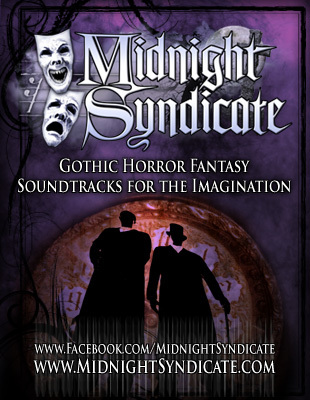 Since 1995, dark music pioneers Midnight Syndicate have been creating gothic, horror, fantasy soundtracks for the imagination. 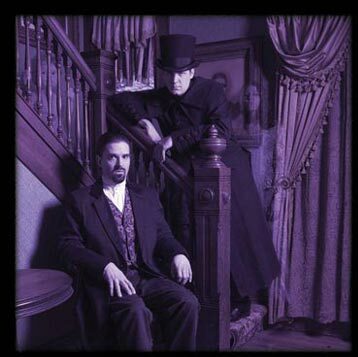 Formed by composer/director Edward Douglas in 1995, their music has become staples of the Halloween, gothic music, haunted attraction, and role-playing game industries. With a catalog of CDs that blend dark, orchestral horror and fantasy movie score-style music with sound effects, the band consisting of Edward Douglas and Gavin Goszka has had its soundtracks to imaginary films featured in everything from Hugh Hefner’s infamous Halloween parties, Dungeons & Dragons, Barbara Walters specials and Monday Night Football to X-Box games, tracks by the Academy-Award winning rap act, Three Six Mafia, and Twiztid as well as concerts by dark music pioneers The Misfits and King Diamond. The music has also been featured on countless television shows and documentaries relating to horror films and the supernatural.